The wave equation has become the standard method for predicting the drivability of piles, along with estimating stresses during driving. However, it’s necessary to have some idea of the pile’s ultimate capacity and driving resistance, so we are bundling the download of WEAP87 with SPILE, the FHWA program for estimating pile ultimate resistance. WEAP (Wave Equation Analysis of Pile Driving) is the program first developed in the 1970’s by Goble & Associates. It and its successors have since become the most commonly used wave equation program for the analysis of driven piles during driving. We present here WEAP87, the last freely released version of the program. Bearing graph screen from WEAP87. A program for estimating the vertical load capacity of driven piles for both cohesionless (using Nordlund’s method) and cohesive ones (using Tomlinson’s Method.) The program is interactive and designed to analyse multilayered soils. It is primarily intended for small (less than 36″) piles, such as H-beams, concrete and pipe piles. Originally developed by the FHWA. Documentation is not included; the methodology behind it is described in detail in the second volume of the FHWA Soils and Foundations Manual. Documentation for WEAP86 (WEAP87 similar). “Recent WEAP Developments,” presented at the 1988 Stress-Wave Conference, an overview of the later features (and some of the background) of WEAP86/87. Partying Like It’s 1987: Running WEAP87 and SPILE (and other programs) on DOSBox. Extensive research on both the WEAP family of programs and CAPWAP was conducted for this 2016 effort; click here for those links. We also have a printed manual available for WEAP87. You can click here for ordering information. Except for the output graphic most of the output of WEAP87 is either text on the screen or text files. All of SPILE’s output is text. Create a directory for WEAP87 and SPILE. Download the ZIP file into the directory you have created. Using an appropriate program, extract the files into the same directory. Each program is in a different directory in the compressed file, to make it easy to keep them separate. Keep in mind that WEAP87 and SPILE are separate programs; you can use one or both of them as you need to. When applying ultimate capacities computed by SPILE to WEAP87, keep in mind that ultimate capacity and driving resistance are not the same; more information can be found in the current FHWA Driven Pile manual. WEAP’s current, commercial version is GRLWEAP, available from GRL. Other information of interest on WEAP is given below. “Hammer Types, Efficiencies and Models in GRLWEAP,” a 2007 article on this subject. 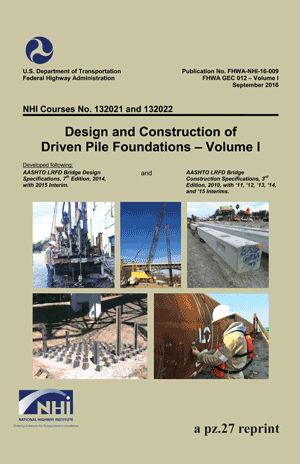 A newer FHWA program for static pile analysis is DRIVEN, which can be obtained here. What is the static bearing capacity of the pile given observations taken during pile driving? 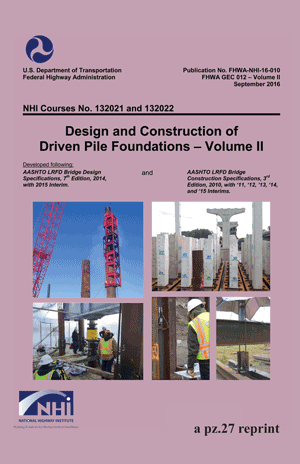 Can the pile be driven given a complete description of pile, soil and hammer properties (driveabilty)? Is the pile structurally sound (pile integrity) ? What are the stresses in the pile during driving? What is the efficiency of the driving system? The following discussion presents a review of available analytical methods and gives examples both of equipment used for measurements and of results obtained. The engineer requires reliable methods for predicting the capacity of piles as driven in the field. Early approaches used semi-empirical methods for making these predictions. The success of these early attempts was mixed. The Federal Highway Administration sponsored research to develop better methcx1s for predicting pile capacity and a method evolved based on the work of Smith (1962) using the wave equation analogy as a means of modelling the pile driving operation and the resulting capacity of the pile. All mathematical models must be calibrated to field conditions in an area. The Connecticut Department of Transportation has conducted many load tests on piles over the years. In this phase of the project, pile capacity as predicted by WEAP was compared to the capacity measured by field load tests. A summary of the early scientific research that forms the basis of the development of one-dimensional wave mechanics is first summarized. Beginning with the work of Donnell in the early 20th Century the subsequent analytical and computational research is reviewed in some detail. The early “wave equation” computer programs beginning in the 1940’s are described and discussed including the applications that motivated the entire development up to the present. Early measurement techniques are reviewed briefly up to the development of the resistance strain gage. This device made possible routine measurements of the force wave in the pile. The development of an accurate and reliable accelerometer was somewhat slower than the force measurement capability but usable devices were available by the time of the Michigan pile tests of 1960. The modern era of pile measurements and analysis began in earnest with the research at Case Western Reserve University. The methods for dynamic pile capacity predictions are summarized up to the present. It is estimated that today over 5000 job sites are tested and analyzed annually. The history of low strain integrity testing is presented briefly and the history of the International Stress Wave Conferences is summarized. Finally a list of American codes and standards relating to this topic is included. A recent research project sponsored by the Federal Highway Administration produced a new wave equation computer program for the analysis of pile driving (WEAP). While the primary purpose of developing this program was to provide a better model for diesel hammers a number of other improvements were included and an extensive correlation study with dynamic measurements was made. This study together with the authors’ extensive field experience pointed out several conditions where wave equation predictions will be inaccurate and unreliable. In this paper the capbilities of the WEAP program will be compared with other commonly used programs. The various factors which can influence the accuracy of a wave equation analysis are considered, evaluated and discussed. The specific topics included are: pile model, soil model, hammer model, and static soil analysis. When reinforced or prestressed concrete piles are driven in easy driving, tension stresses are reflected from the pile tip back onto the downward traveling compression stresses. This can produce resultant tension stresses in the pile that can be sufficiently large enough to cause tension cracking of the concrete. This problem can be analyzed by use of a “Wave Equation” analysis. If measurements are made they are usually made with transducers located near the pile top. However, the critical tension stress location will not be at the gage location so the magnitude of maximum tension stresses cannot be readily determined. In this paper a procedure will be presented for determining the maximum tension stress in the pile given measurements at the pile top. In addition a procedure will be discussed for calculating maximum tension stress using a closed form solution of a continuous model of the pile. 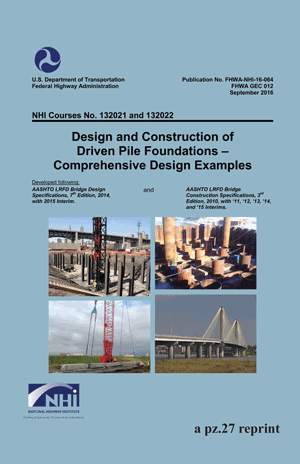 An overview of the concept of LRFD as applied to driven piles. Consideration of the advantages and disadvantages of the method over ASD are considered. Specific situations, such as the use of dynamic measurements, are also considered in detail. A study was undertaken on the performance of pile driving systems and the existing technology for the measurement of performance parameters was reviewed. 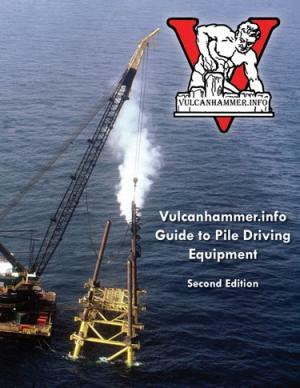 This report is an inspection manual for use by pile driving inspectors and engineers to ascertain that the pile hammer conforms to certain minimum standards, and to record observations on hammer and driving’system behavior. The manual considers only impact hammers; i.e., a large weight is alternately being raised and then accelerated downward, impacting against the pile top. Vibratory hammers, which operate on a different principle altogether, have been excluded from this manual. 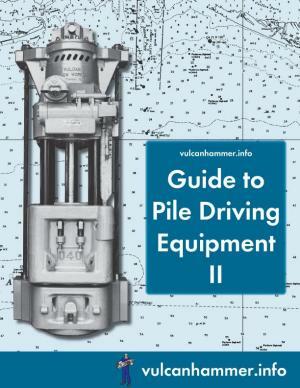 In addition to pile impact hammers, the manual addresses the complete driving system to include cushions, helmets, and leads. Also included as an aid to the inspector/ engineer, are comprehensive field inspection data forms. The Bridge Section of the Oregon Department of Transportation (ODOT) is responsible for the design of all bridge structures and routinely uses GRLWEAP for controlling pile driving stresses and establishing capacity from the bearing graph. The LRFD resistance factor, φ, for GRLWEAP sets the factored amount of nominal capacity in the LRFD inequality. Foundation conditions throughout Oregon’s Willamette Valley and the Portland metropolitan area are predominantly sand, silt, and clay. Steel pipe and H section foundation piles typically are of sufficient length to be friction piles and exhibit set-up after the end of initial driving (EOID). The two objectives of this study were to build an extensive database of driven pile case histories to include restrike conditions from the present available sources that reflect ODOT’s diverse soils and piles, and to establish φ factors for EOID and beginning of restrike (BOR) conditions using GRLWEAP to match ODOT practice. A diverse group of existing databases, including the FHWA-built DFLTD and NCHRP 507 PDLT2000, were accessed and merged with new cases from the literature to build a comprehensive database, called the Full PSU Master. Neither of these two national databases proved always correct for the large amount of source input required, with the largest source of anomalies and missing data being the blow count, especially at the BOR condition. Over 150 new cases were added to establish the Full PSU Master database containing 322 piles, with each case placed into one of three input tiers for statistical profiling to assist in preserving quality for the φ calibration. The Full PSU Master database then supplied 179 cases analyzed by FHWA static capacity software DRIVEN and by GRLWEAP for capacity prediction by the bearing graph. These predictions generated bias mean λ and COV statistics for a range of ODOT selected scenarios. The 322 piles ranged up to 40 inches in diameter, and up to 197 ft in embedment length. The 179 analyzed piles ranged up to 36 inches in diameter and 167 ft in embedment length and had driving blow counts up to 100 BPI. This research showed similar trends for GRLWEAP capacity as that reported in NCHRP 507 for CAPWAP capacity on the statistical effects from variables such as blow count ranges. Sub-grouping λ by blow count revealed a clear decay in easy driving mean λ and COV parameters when blow counts were ≤ 2 BPI. Above 2 BPI, little difference was found in these parameters, and no upper limit of statistical accuracy was identified. A clear difference in statistical sample characteristics existed between piles supported in predominately cohesive soils to those in cohesionless soils, and also between pile types. For the ODOT case of redundant piles in groups, a reliability index β at 2.33 was used to establish φ resistance factors and φ/λ efficiency measures. Statistics for an initial ten scenarios were generated, and the First Order Second Moment (FOSM) resistance factor at EOID and BOR was reported, based on lognormal fits to the λ distribution. The final five ODOT selected scenarios to permit comparison to NCHRP 507 and to form a basis to design implementation measures underwent advanced Monte Carlo based probabilistic procedures using random number generation and the λ lognormal tail fits to provide EOID and BOR φ factors. Recommended resistance factors from the visual tail fit procedure on the likely best fit to ODOT practice scenario containing all soil and pile types were 0.55 and 0.4 for EOID and BOR respectively. Recommendations were made for a separate implementation activity, including additional φ calibration work based on the Full PSU Master including use of field measured hammer performance, CAPWAP based soil input parameters, and pile type. The estimation of pile driving costs remains today a very inexact activity not greatly changed over the past half century. Contractors tend to limit their work to a particular geographical region relying on equipment of a familiar type. If a job must be estimated, the contractor will usually depend more on previous experience than on anything revealed by normal subsurface investigations. Equipment selection is usually made on a completely subjective basis, with emphasis placed on the use of driving systems owned by the contractor. If difficulty occurs on the job and the piles cannot be efficiently advanced, the typical result is quarrels hetween the contractor and the engineer, large cost overruns and litigation. To avoid these problems, engineers have sometimes tended to specify the job more tightly.Commonly, however, due to the engineer’s lack of knowledge of pile driving, he specifies a condition that cannot be driven. Now the contractor is in an excellent position to obtain extra payment. In the past decade techniques have become available that can convert this very artistic approach to a scientific one. It is possible today for a contractor to make rational predictions of driving resistance. These predictions, while still of limited reliability, are at least better than any other available approach. In this discussion of impact problems, the wave mechanics of both continuous and discrete pile models are illustrated. The equation which will be derived should be helpful in the understanding of the pile driving process, the Case Method, CAPWAP, WEAP, pile integrity testing and data intermpretation. Examples and some useful numerical values will be given. Always a uniform pile with linear properties will be assumed except where otherwise noted. In 1972 the Ohio Departrnent of Transportation changed their pile driving specification to read, essentially, that H-piles driven to rock should be driven to a blow count o f 20 BPI (blows per inch), independent of hammer size or any other consideration. Since this change in specification was controversial, a research project was undertaken to investigate it at Case Western Reserve University under the sponsorship of the Ohio Department of Transportation and the Federal Highway Administration. The goal of this study was to evaluate the performance of steel H-piles driven according to the specification under a variety of conditions. A variety of site and hammers were used; at each location the piles were driven to the 20 BPI criterion and the results evaluated. Extensive dynamic measurements were made throughout the tests. Note: although many state DOT’s and other agencies have adopted refusal blow counts greater than 120 BPF (10 BPI,) Vulcan never warranted its onshore hammers past the 120 BPF limit. The source code is hard to read in the original, so the FORTRAN source code in ASCII format can be found here. The motivation for the preparation of the WEAP program came from problems which were experienced by the New York Departrment of Transportation when they attempted to implement routine wave equation analyses into their pile driving practice. They used a program prepared by the Texas Transportation Institute . In spite of the fact that this program was probably the most widely used wave equation program in the United States, serious difficulties were encountered in that unrealistic stresses were sometimes obtained for piles driven by diesel hammers. The authors of this report have performed extensive research studies on pile driving emphasizing the measurement of force and acceleration during driving. These measurements involving piles driven by all types of hammers have been made for several states including New York. In order to take advantage of these measurements, the Federal Highway Administration contracted with the authors t o prepare a wave equation program which would accurately model the diesel hammer. Several years had passed since the TTI Program was developed, so it could be expected that other general improvements could be introduced into the program for all types of harmers. Finally the large volume pf available measurements of force and acceleration at the pile top were used to test the program performance. The first presents a general discussion of tine use of the wave equation and how this particular program models the hammer-pile-soil system. Emhasis is placed on a discussion of the operation of diesel hamers and how that operation is modeled by WEAP. The second volume provides a description of program input and output and can serve as a user’s manual for the program. 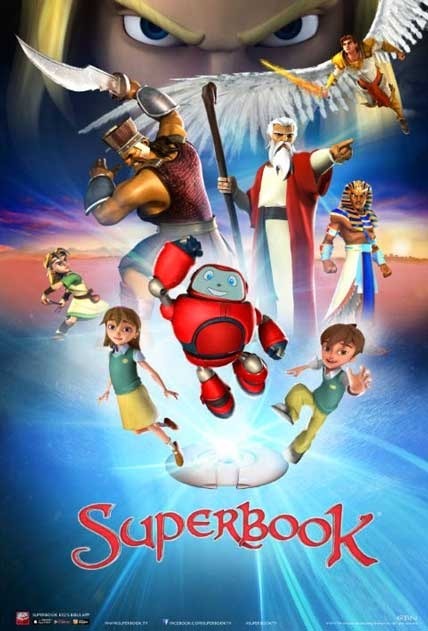 It is strongly recommended that all users read Volume I prior to the User’s Manual so that they will understand the assumptions contained in the program and how it is intended that it be used. The third volume was prepared to aid the computer operator during the initial stages of program and data file loading. It also contains a flow chart which may be of interest to those users who want to study the program in greater detail. The fourth volume contains the three parts of a lecture which is also available in the form of a tape/slide show. The contents of this narrative report deal with background, models and applications of the Wave Equation.